Acey F2 potato leaf plant 1 - Bright yellow golf ball shaped and sized tomatoes with a delicious, intense, bright flavor - similar in fact to Barossa Fest. Well worth pursuing. Acey F2 potato leaf plant 2 - Similar fruit size and shape and color as plant 1, but with inferior flavor. Not a high priority for further work. Acey F2 regular leaf - medium sized oblate fruit that are pale red/scarlet outside, and light red with yellow overtones inside, not quite as flavorful as potato leaf plant 1 described above, but very good as well as prolific. Promising. Acey F3 potato leaf - this was the best of the four, producing oblate medium sized fruit that are bright yellow in and out and with excellent flavor. Very similar in color, size and shape to Dwarf Mr Snow, but with larger seed cavities. This is a lead candidate going forward. Artsy F2 plant 1 - Artsy is my cross between Variegated and Perth Pride. Artsy plant 1 is a lovely plant, with excellent fruit set. The tomatoes are in the 3 ounce range, smooth slightly oblate, and red in color. The flavor is very, very good - clearly better than the Variegated parent, with some of the nice tang of Perth Pride. This is a promising lead. Artsy F2 plant 2 - This is a bit of a mystery. The young seedling had quite fine foliage, clearly smaller than expected - making me wonder if some Silvery Fir Tree is included in this possibly complex cross. 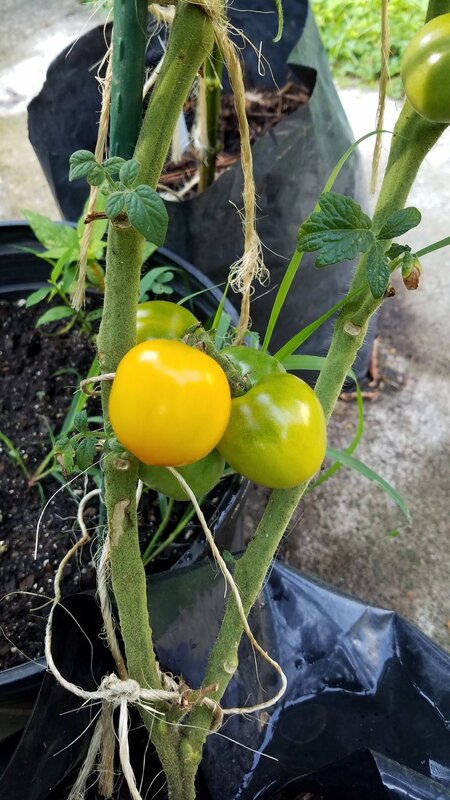 The tomatoes ripened red, and were similar in size to the Variegated indeterminate parent, though with far better flavor. Promising lead. Scotty F2 - My aim in the Scotty cross was to start to delve into some of the E. C Green varieties offered by Livingston in the early 1900s - he was the first to use Honor Bright (a very unusual variety with nearly yellow foliage, white flowers, and tomatoes that go from white to red) as a parent, crossing it with some of the dwarfs of that time to eventually create yellow foliaged dwarfs. Scotty is a cross between a weird potato leaf, yellow leaf variety I found years ago in Turkey Chomp and call Surprise, with Dwarf Scarlet Heart. The offspring of this cross should be very complex - potato and regular leaf, green and yellowish foliage. 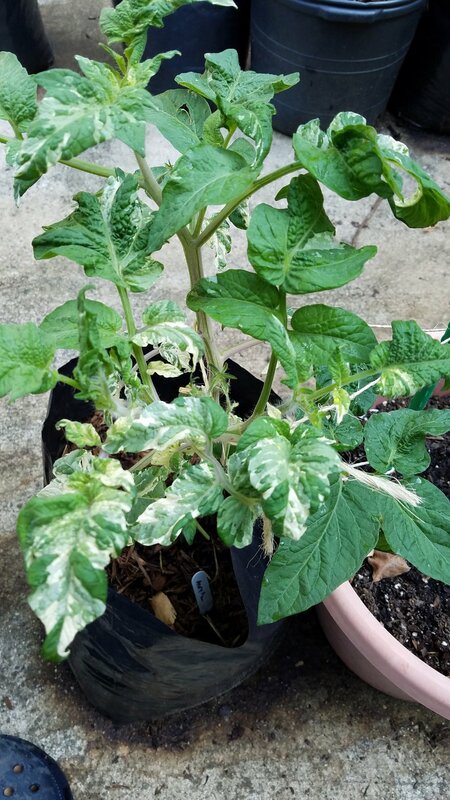 Once the tomatoes ripened, it was clear to me that I mixed some Sandy seed into the Scotty sample, as the variegation patterns and fruit color (light stripes) matched my Sandy results...so mystery solved. See Sandy F2, above, for the description of the ripe fruit and status going forward. My work on dwarf paste tomatoes - primarily the Speckly family (my cross of Speckled Roman with Dwarf Golden Heart) - is limited this year. Yet, there is good news to report. The numbers below, and further on, are my reference vial numbers that were assigned to seed sent to me by project volunteers. Speckly selection 5716 - moderately healthy, very compact dwarf, producing 2-3 ounce paste tomatoes with a nippled end - red in color, and quite flavorful. I'd like to see better production, but it is a good lead. Speckly selection 5994 - another very compact plant, healthy, tomatoes round to oval and red with faint stripes, very good flavor, and a promising lead. Speckly selection 5718 - healthy and vigorous, heavy yielding, with large blunt heart shaped red fruit approaching 8 ounces. The tomatoes are meaty, and flavor very good indeed - this is a very promising lead. Speckly selection 5718 grown by a garden friend - this is an even more exciting result. The tomatoes were distinctly heart shaped, and were red with clear vertical golden stripes. The meaty tomatoes were delicious. This is a top lead. I made quite a few crosses toward some great dwarf cherry tomatoes. 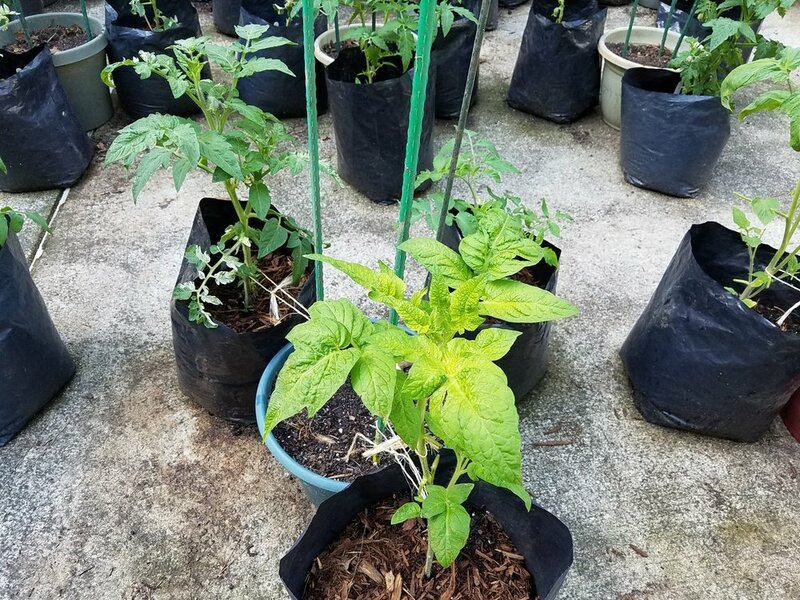 I focused on a few from Burly (Sun Gold X Dwarf Beryl Beauty) and Steamy (Sun Gold X Dwarf Pink Passion) and one each from Reddy (Egg Yolk X Iditarod red), Zooty (Sun Gold X Tennessee Suited) and Teensy (Mexico Midget X Summertime Green); there are lots of volunteers working on these. Burly selection 5992 - nice healthy 3 foot tall plant, lanky, good fruit set of oval large cherry tomatoes that ripened red, instead of the expected pink. Flavor was sweet, and this is a nice lead for a tasty large pink cherry tomato. Burly selection 5778 - same growth habit, fruit set, shape and size as 5992 above. The tomatoes were very similar to those obtained from 5992, described just above - one curiousity was that the tomatoes were often seedless! Certainly a promising lead as well. Other Burly selections grown by friends - This line wasn't extensively studied, but we have a few good flavored yellow cherries to further investigate. Steamy selection T16-24 - Lovely plant, stocky, healthy, loaded with fruit - beautiful fruit shape of a smooth teardrop, pink, sweet, nice flavor. Similar result to last year - working name for this is Liz's Teardrop, in memory of Sue's sister. A real curiosity, though - the tomatoes have few to no seeds at all, which may be an issue for propagating enough seed to advance; otherwise, this is a top lead. Steamy selection T16-25 - Very similar to T16-24, with a slightly different shape - more of a mini paste - and not quite as heavy yielding - but with perhaps a slightly more intense flavor, and it does have some seeds. Top lead, not yet named. Other Steamy selections grown by friends - Aside from pink, the other color found was red. Productivity and flavor of all selections is excellent. We still hope to see something orange, but alas, not yet! Reddy selection 5784 - Healthy plant loading up with one ounce oval tomatoes that ripen a bright yellow. Very nice, lively flavor. Color of the father (Egg Yolk), fruit size half way between that and the mother (Iditarod Red). This is a nice lead, and I like it better than the released Kangaroo Paw Yellow. Teensy selection T16-41 - Healthy plant, on the tall side for a dwarf - half way between a dwarf and an indeterminate, probably due to the Mexico Midget parentage. Healthy plant with great fruit set, small cherry tomatoes that ripen chocolate brown, very good flavor, juicy. This is a promising lead and will have lots of competition from other chocolate colored selections being found in this line. 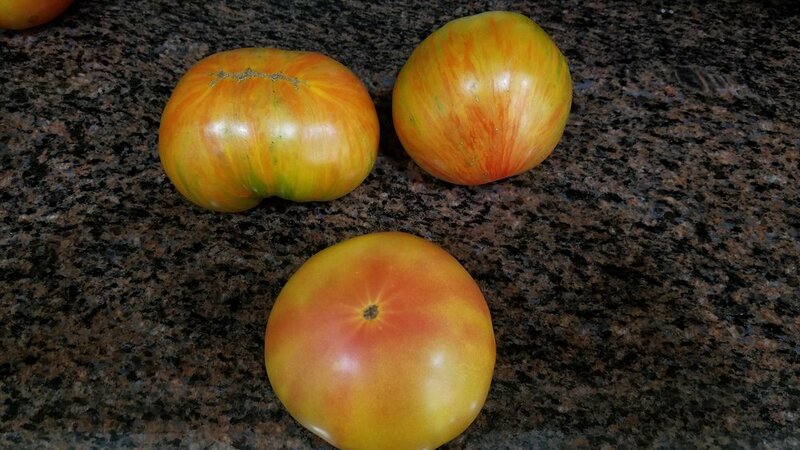 Other Teensy selections grown by friends - Aside from chocolate colored cherries, the other colors found were red, yellow, purple, and both clear skinned and yellow skinned green flesh; a few were more like small oblate beefsteak shapes than round. Lots of diversity, lots of work remains! Many are very promising. Zooty F2 - now this is a find! Nice compact dwarf; had lots of disease early (very dense plant), but that was removed and it looks fine. Fruit are small to small/medium oblate, orange with green stripes, and delicious! Since it is one of the few Sun Gold offspring showing some of the distinctive flavor, this is a top lead. These are fun, complex lines to work with, and the goal is to create unique looking, high anthocyanin colored dwarfs with good flavor (the main high antho variety, Oregon Blue P20, simply doesn't taste very good). The two main families are Anthy (a high antho pink determinate cherry sent to be by gardening friend Marcia, crossed with our green striped plum shaped dwarf Saucy Mary), and Lampy (Oregon Blue P20 X Tennessee Suited - a cross I made while being filmed for the Growing a Greener World episode; the aim is to create a tomato for Joe Lamp'l meeting his preferences that he can name and we can work on together). Anthy plant 1 - Three of the Anthy selections were very heavy yielding - plants 1, 2 and 3. This selection produced slender plum to pear shaped tomatoes of about an ounce with no antho coloring. Ripe fruit were red with bold gold stripes, and red flesh. The flavor was balanced and mild, and this would make a wonderful drying or sauce tomato. Promising for the paste candidates, but no antho. 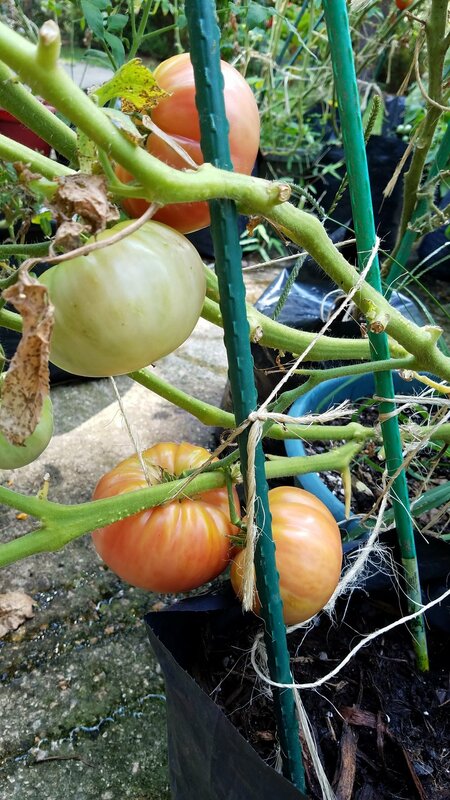 Anthy plant 2 - This and plant 3 were essentially identical, producing loads of elongated tomatoes of an ounce or more, 2-3 inches long by 1 inch wide, ripening to pink with strong antho shoulders. The flavor was mild and balanced. This is a very promising high antho colored lead with none of the off putting flavor that seems to follow the antho tomatoes. Anthy plant 3 - Plant 3 is essentially the same as plant 2. 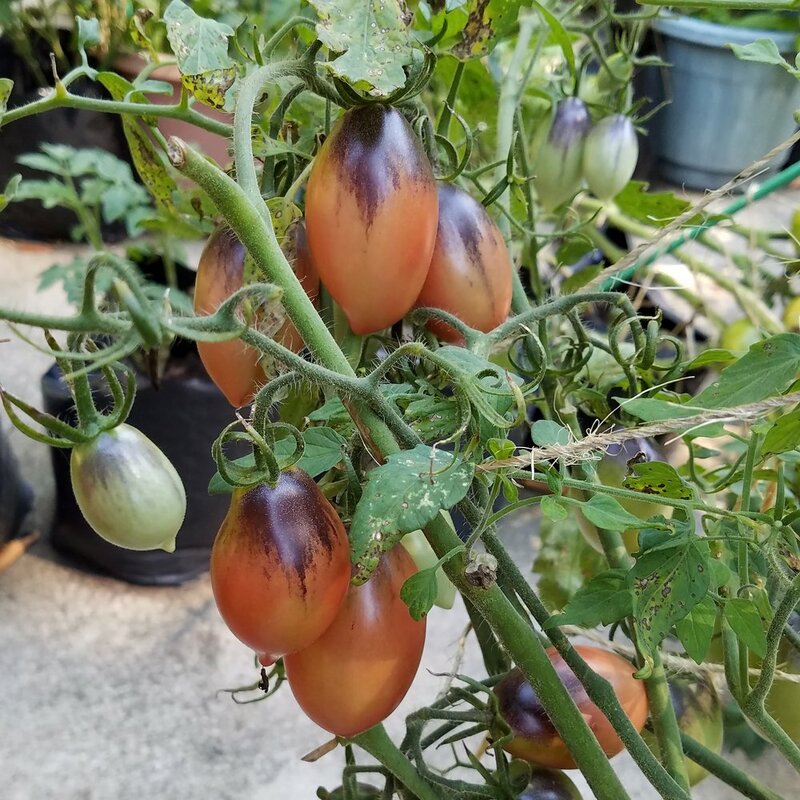 Anthy plant 4 - Clearly more of a determinate dwarf, the very compact plant produced clusters of small, egg shaped large cherry tomatoes that ripened purple with dark antho shoulders, and with a very good flavor. Promising. 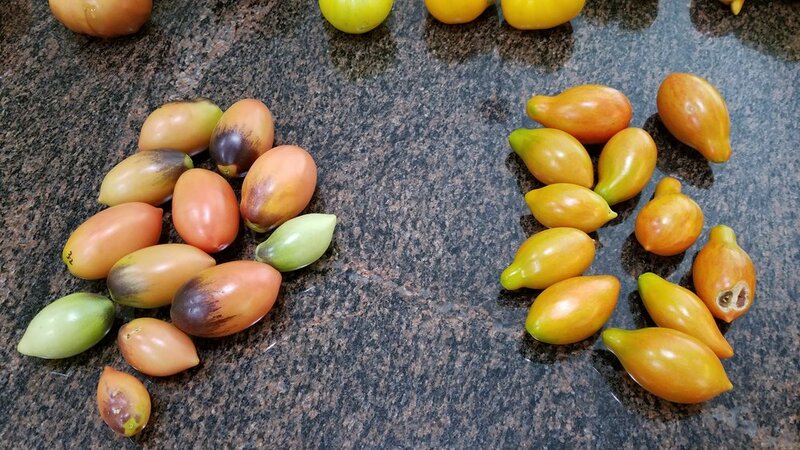 Other Anthy selections grown by friends - This is a very diverse line and friends found some interesting leads, such as yellow plum tomatoes with or without striping - some with very strong antho shoulders. A few will be nice leads; flavor on all of them ranged from good to very good. Lampy line - I grew out 6 dwarf selections that showed antho shading in the seedlings. 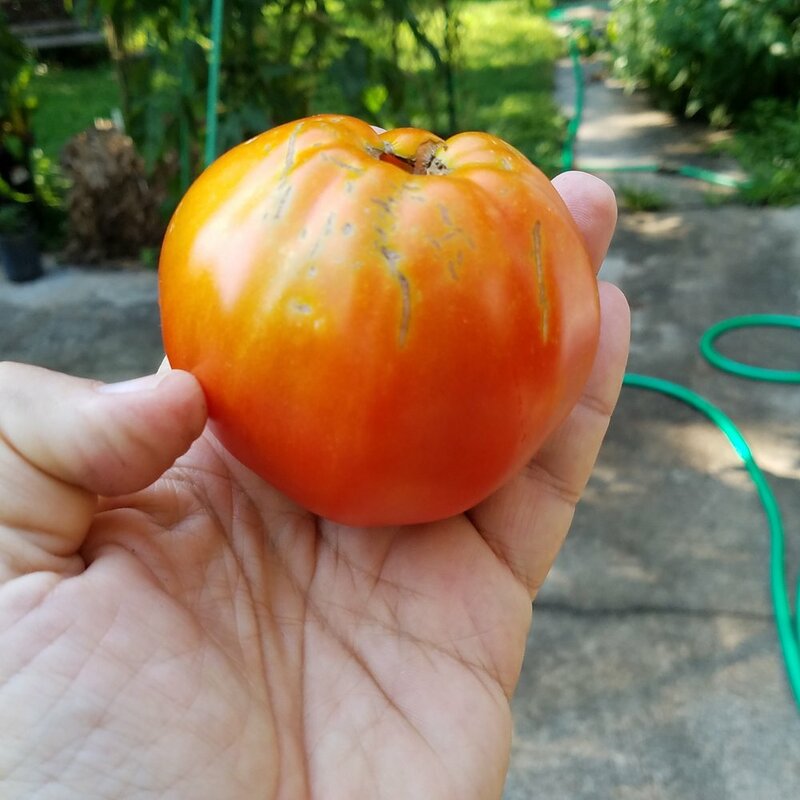 One of the 6 ripened fruit that were devoid of the antho coloring, but did have faint stripes, the final color being red with faint gold striping, with excellent yield and good flavor. The other 5 selections showed strongly antho colored shoulders, but no striping, and the ripe fruit color was deep red. One had good fruit size (6 ounce oblate), with flavor approaching excellent. I didn't find what I hoped to find (striped purple fruit with antho shoulders), but we do have a few promising leads....and it will be worth going back to the drawing board and seeing what else can be found. I am growing only one offspring in the Morty line that is showing distinct chartreuse foliage (Morty is Charlotte Mullens Mortgage Lifter X Summer Sunrise). The real oddity is the Scotty line, described above in the Variegated section. See below for the specifics. Morty selection T16-184 - Last year this was a lovely potato leaf chartreuse foliaged plant with medium to large red oblate tasty tomatoes. This year the plant looks as expected - a dwarf, but on the tall side - the chartreuse color gene seems to "stretch" the plants, making dwarfs and indeterminates with that leaf color particularly lanky. The fruit were of good size - 8 ounce range - oblate, smooth and pink, with very solid, low seed content interiors and a nice balanced flavor. This is a promising lead. Back to Scotty - and a curious observation - All of the Scotty seedlings show distinct spotting - different from Septoria - pretty much all the way up the plant, starting on the lowest leaves. They in general don't look very healthy - wondering if the cross revealed some genetic disease susceptibility. All unripe fruit on the Scotty plants were white. Scotty plant 1 - Potato leaf dwarf with the yellowish foliage of the Surprise parent. IThe unripe fruit was white, and it slowly ripened through orange, to red. Fruit size topped out at 8 ounces, oblate and shape, with excellent flavor - very promising and unusual. Scotty plant 2 - The plant type was the same as plant 1 above, but the fruit were mostly heart shaped; more solid (less seeds) inside, not as tasty. Certainly unique, and worth pursuing, as it carried the fruit shape of its mother. Scotty plant 3 - This plant really struggled, and managed to ripen one fruit before going down to disease...oddly, the tomato it produced was round and pink, after going through the white stage. Certainly promising. Scotty plant 4 - The ripe fruit color was red, and the yield substandard due to early disease onset. Worth pursuing a bit more. Leafy F2 regular leaf - Lovely result - medium sized, smooth oblate white tomatoes that were very tasty. Very promising. Leafy F2 potato leaf - Another really nice tomato - medium to large, smooth oblate clear skinned, green fleshed tomatoes that were just delicious. Very promising. Betty F2 regular leaf - This was quite an oddity - medium sized, oblate tomatoes - lots of them! - that were clear skinned, green fleshed, but with a strong purplish blush in the center and on the blossom end - very meaty interiors with the seeds around the periphery, and very good flavor. Promising and unusual. Betty F2 potato leaf - Another Betty oddity - the tomatoes were bright yellow with a strong pink blossom end blush, marbled interiors, and good flavor. Promising and unusual. Tiggy F3 regular leaf - From a cross between Tiger Tom and Dwarf Mr Snow, my plant grown from seed saved by a volunteer from small striped tomatoes gave me large striped, tasty tomatoes, which are very promising. So, that's it - a long read for those who have been following our project. There will be lots of opportunity to jump in, as I saved plenty of seeds from all of the selections. At the appropriate time, all you need to do is contact me and ask for seeds of those that you wish to try.